Note: Although this is classified as a plucked idiophone, the tongues (lamellas) are typically depressed and released creating the same effect as being plucked. This is done with the thumbs and fingers of the performer. The tongues can also be plucked as another type of performance effect. HISTORY: The mbira has been an important instrument in sub-Saharan Africa and has played a part in African culture for 800 years. Although it can be a solo instrument, it is more commonly used as an accompaniment to singers, musicians and dancers. It is not uncommon for the native African instruments to allow solo harmonization, but typically, harmony in African music serves as a variation to the theme being performed. Many versions of the mbira exist with tribes creating distinctive performance styles and names for the instrument. They vary widely in appearance, size, materials, and tuning from the smallest 6-note models of the Kalahari Bushmen, to the sophisticated 33-note instrument found in Zimbabwe. The name mbira is know throughout much of Africa, but regionally, the name mbira is more commonly used in Zimbabwe, while the name Kalimba is used in Kenya, the name ikembe is used in Rhuanda, and the name likembe is used in the Congo, while other names are bit less common such as sanza, sansa, marimba, marimbula, there are more generic names of finger harp, gourd piano, and thumb piano that are often used in the west. The mbira is also known as the thumb piano, because one's thumbs are used to pluck (or more accurately depress and release) the metal strips (tongues or lamellas) that sound particular notes. It is common for two mbiras to play together where one covers the melodic accompaniment of the singer while the other plays the bass line (or bourdon). Some mbiras have few tongues and others have many. Some of the more sophisticated instruments have two sets of tongues for one performer to play melody and harmony, or melody and bass line on the same instrument. In the 1920's, Hugh Tracey came from England to Rhodesia (now Zimbabwe) to help his older brother run a tobacco farm. He became fascinated by the local music culture and created the Kalimba, a version of the mbira. Introduced by Tracy in the early 1960's, Kalimba was the registered trademark for his diatonic instrument that soon became popular around the world. The word kalimba literally means little music. It was well suited for Western music and made it easy for the performer to play harmony using both thumbs. Today, versions of this African instrument can be found in most parts of the world, with a wide use in parts of Asia, the Middle East, North and South America. Much of this popularity is due to the work of Hugh Tracy, but the simplicity of the instrument's design and construction and the relative ease by which one can learn to play it has added to it's wide acceptance throughout the world. 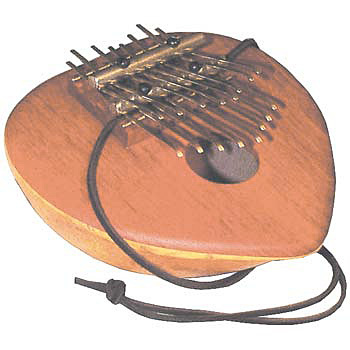 PHYSICAL DESCRIPTION: The basic mbira is a simple soundboard or soundbox with wooden (typically cane) or metal keys or tongues (called lamellas) attached on the top. The soundbox is typically made from a calabash (gourd) or wood, and often the metal keys (tongues) were made from old spoon handles, bicycle spokes or spring wire that were cut and hammered to the desired shape. The keys (tongues) are plucked with the thumbs, or with combinations of thumbs and fingers. The keys usually consist of 6 to 33 metal keys (tongues) mounted across two bars (or wooden dowels) at one end attached to the soundbox with another wooden dowel holding them in place. The bar closest to the soundhole serves as a bridge, the other to provide a means for the dowel to hold the keys (tongues) in place. The free ends of the keys (tongues) are positioned at different lengths to produce the variety of pitches. The length of the vibrating end of the keys (tongues) determines the pitch (a shorter key or tongue produces a higher pitch, and a longer key or tongue produces a lower pitch). Many of the mbiras with soundboxes, have holes drilled in the sides of the soundbox. When the instrument is held in both hands with the thumbs plucking the tongues, the index fingers on each side can cover and uncover these side holes to change the resonance and can provide a tremolo effect. The mbira often has several rows of keys (tongues) positioned like multiple manuals (or rows of keys) on a keyboard. The lower manual (typically longer tongues and lower pitched notes) often represent the men's voices, while the upper manual (typically shorter tongues with higher pitched notes) represent the young men's voices, or are split with one side of the upper manual representing the young men's voices and the other representing the women's voices. The tuning and arrangement of the tongues are varied. SOUND PROPERTIES: The mbira produces a haunting, fluid percussive sound that is considered tranquil and enchanting. Since you can play either simultaneously or alternating between both thumbs, harmonic and rhythmic effects are possible. An important feature of mbira music is its cyclical nature, with each new repetition of a theme varying slightly from the last and incorporate numerous interwoven melodies, with contrasting and syncopated rhythms. Mbira music lends itself to rhythmic and melodic diversity, and entails a great deal of improvisation, qualities common to African traditional music. The compositions usually consist of a main melodic part (kushaura), and a secondary melodic part (kutsinhira). A special attention should be paid to the combination of quadruple (4/4) and triple 3/4 meters within the rhythmic structure of the music. Most compositions can be thought of as a sequence of four 12-beat phrases. Those 12 beats can be divided into three groups of four, or four groups of three. While the Mbira can be an effective solo instrument, it is rarely found by itself at traditional Shona religious ceremonies. It is ordinarily accompanied by hosho players, handclapping, and singing. The persistant array of complex rhythms and variations of the melodies provides a rich source of sounds that captivates listeners. Many effects can be employed by plucking up or down on the keys (tongues). The sound can also be altered by wrapping the tongues with wire or adding a mirliton device. This adds an additional buzzing or humming character to the sound of the instrument which is an important sound in many of the tribal cultures. Often, snail shells or metal bottle caps are often attached to the soundboard or the soundbox to create or enhance the rich buzzing sound. The buzzing is thought to clear the mind and allow the listener to focus totally on the music. These buzzing effects are not commonly used on the diatonic versions of the mbira or outside of the African tribal cultures. Most recordings do not include these effects as they tend to favor the pure sounds of the instrument. Mbira tunings are numerous, and usage depends on personal preference. Mbira players usually settle on a particular tuning and use it consistently. Some of the more common Mbira tunings are Nyamaropa (most common), Gandanga Dongonda, Gandanga (or Mavembe), Nyuchi, Dambatsoko, Katsanzaira, Mande, Nemakonde, Nyamaropa Dongonda, Samsengere, and Saungweme. RANGE: The range for the mbira is widely different for each tribal area in Africa. Each instrument can be tuned to a number of tuning systems that are also part of a tribal or local area standard. This would also differ by the number of keys or tongues on each instrument.